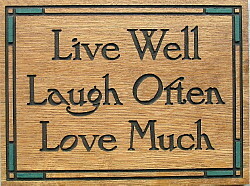 "Signs of Life" Custom Arts & Crafts style hand finished oak mottos is the creation of artisan Eric Zimmermann. His shop is down the street from the Roycroft campus so the influence of Elbert Hubbard is still at work today guiding his three skilled craftsmen in creating carved mottos with many of the mottos original to the Roycroft era. The quality of the workmanship is outstanding.The lettering is sharply carved into quartersawn 3/4" thick white oak slats. The slats are finished in a medium oak stain and the inset lettering is handpainted in black. There is also a keyhole in the back for hanging. 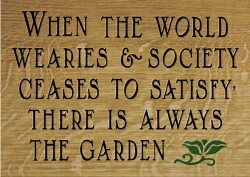 Mottos are usually carved to order so please allow 3-4 weeks for delivery. Due to the size of some of the longer slats, they ship 'oversize' requiring an additional charge. 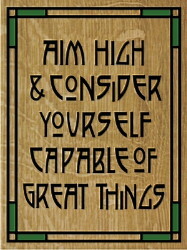 Custom carved mottos are available, please call for information.